Who should consider the Austin HealthMate Plus? Why is the Austin HealthMate Plus the best choice? All air purifiers come with a filter. The information listed here is for replacement filters. All replacement filters have 5 year life expectancy. 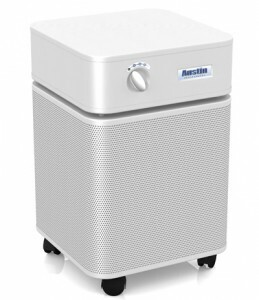 Replacement filter for the Austin Air HealthMate Plus Air Purifier. It is the best Austin Air Filter for extreme sensitivities and is our ultimate protection from irritant and contaminated air. 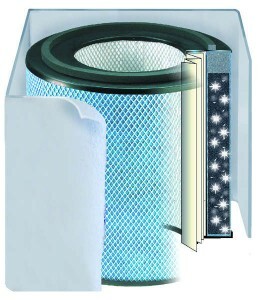 The HealthMate Plus Filter is designed to fit into all our standard size Austin Air Purifiers. This filter has all the design features as the standard HealthMate Filter with an additional additive of potassium iodide. This mineral combined with the activated carbon and zeolite, delivering greater capacity for removal of chemical gases, or Volatile Organic Compounds (VOCs), thus improving relief for people for the severely chemical sensitive and effectiveness in highly contaminated air spaces. It is recommended for people who have heavy air quality problems and those that are chemical sensitive. In the unlikely event that you’re not completely satisfied with your Austin Air cleaner, return it within 30-days, no-questions-asked.